Today we discussed the snippet from ﻿The Office we watched yesterday; we looked at four Dilbert cartoons; and we watched the first ten minutes of Office Space. The four cartoons can be seen here, here, here, and here. We then discussed similarities in the way the work environment, bosses, and average employees are presented in Dilbert with the way they are presented in The Office. 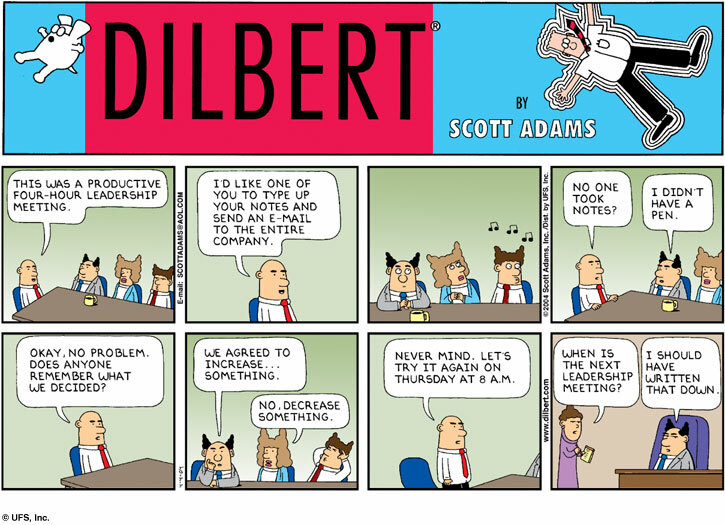 Some background on Dilbert is here. Harvey Pekar wrote autobiographical comics under the series title American Splendor in the 1970’s and 1980’s. He worked primarily as a file clerk in Cleveland, writing comics and jazz reviews on the side, and becoming a minor celebrity along the way. What impression does he give of the life of the “average working man”? Where can such a man take satisfaction in life? What makes him happy? What’s he afraid of? What frustrates him? Jim Lo Scalzo made a short film, “Ghosts in the Hollow,” which documents deserted coal mining towns in the Appalachian mountains. Check it out, and think about different characters in October Sky speculating that their town will, eventually, disappear.